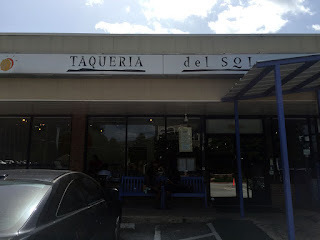 You can find this location of Taqueria Del Sol at 2165 Cheshire Bridge Rd NE, Atlanta, GA 30324 along the infamous Cheshire Bridge Rd (hidden between industrial and commercial expanses and the occasional "interesting" business establishment - heh). This is the original location of the flagship restaurant Sundown Cafe and what amounts to at Atlanta institution (if anything can be called that). The original Sundown Cafe provided Tex-Mex with a twist - your basic Mex-Southern fusion long before anyone had come up with that term. 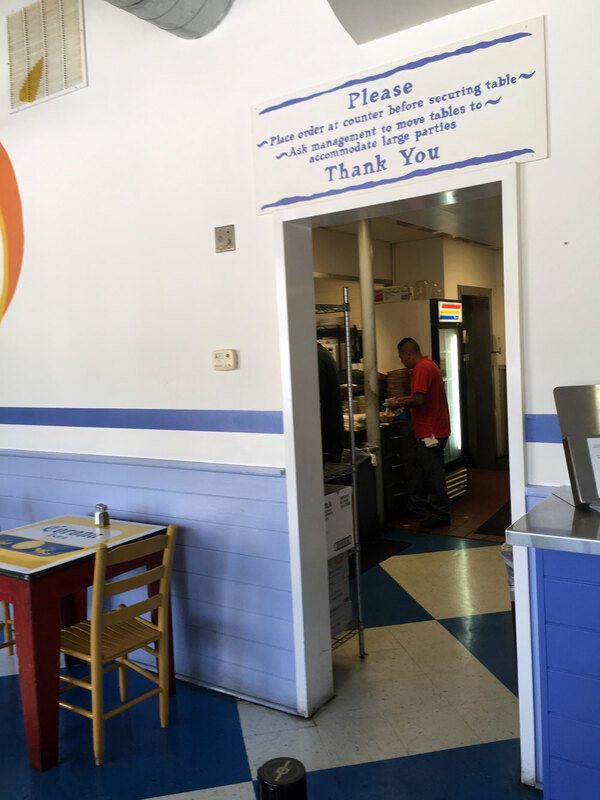 The interesting thing about this location is that there's still a "blue plate" offered up that harkens back to the Sundown menu - the soupy turnip greens are a prime example. I've eaten at the location near King Plow, which is usually much busier than this one, but also doesn't seem to have the same level of charm (or parking). I had come for dinner to Sundown Cafe for many years prior to the changeover to a Taqueria - the same people seem to be working here as then (it used to be a sit-down and order restaurant rather than fast casual). I recently dropped in and had lunch with my SEO/SEM team from a previous job and once again enjoyed the spicy salsa and soft-shell tacos. 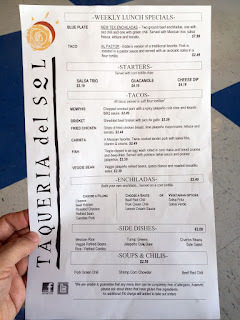 This location of Taqueria Del Sol is a bit larger than the others with a rather expansive kitchen. There's also plenty of seating with overflow to an outdoor deck. 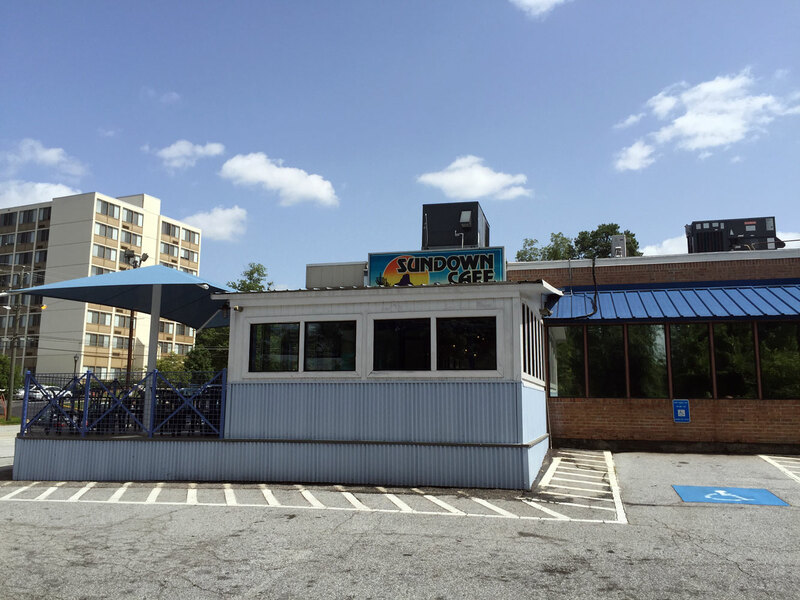 It still wears the Sundown Cafe sign like a badge of honor so look for it when you're driving down Cheshire Bridge - it's much easier to see and read than the white-background "Taqueria Del Sol" sign near the street. 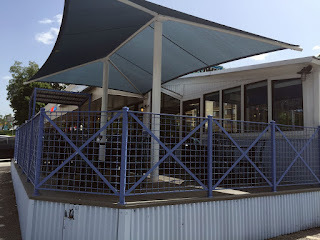 Parking is out front or along the side - there tends to be plenty. 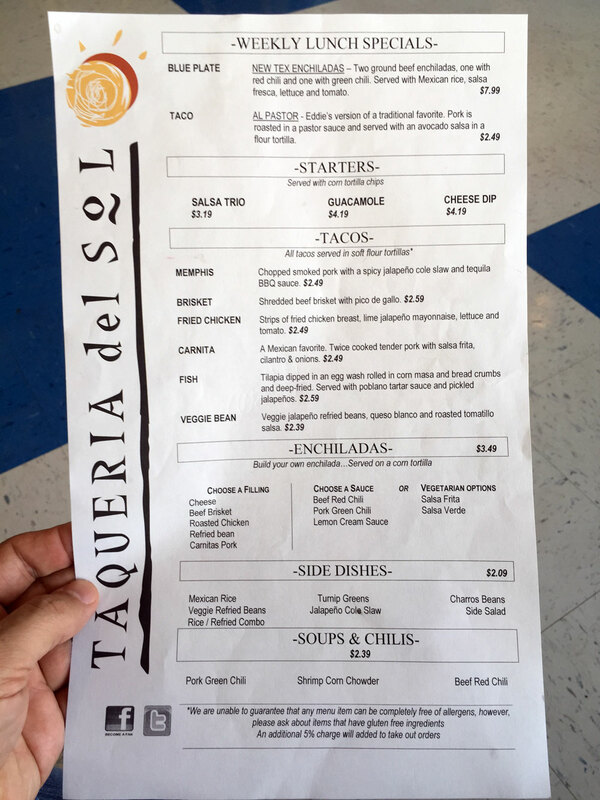 As you enter, you'll see a counter where you order - the menu is fairly simple, featuring sections for Weekly Specials at the top, followed by Starters, Tacos, Encheladas, Sides and Soups/Chiles. 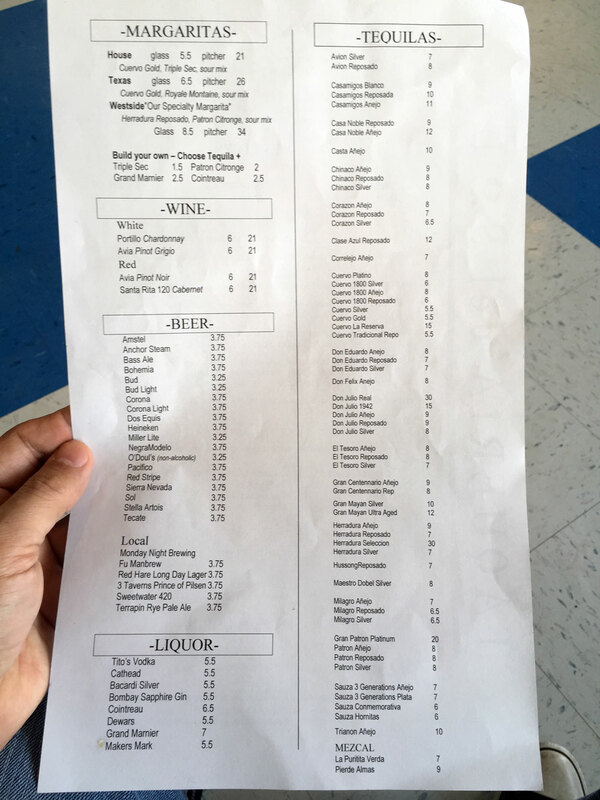 The flip-side has Margaritas (which aren't bad, by the way), Wine, Beer (including a section of local craft), Liquor and Tequila. The Tequila menu is quite extensive and has a good selection of my favorite, Herradura. We started with the Salsa Trio featuring two salsas (one mile and the other smokier and a bit spicier - chipolte if I'm not mistaken) and a tomatilla verde. 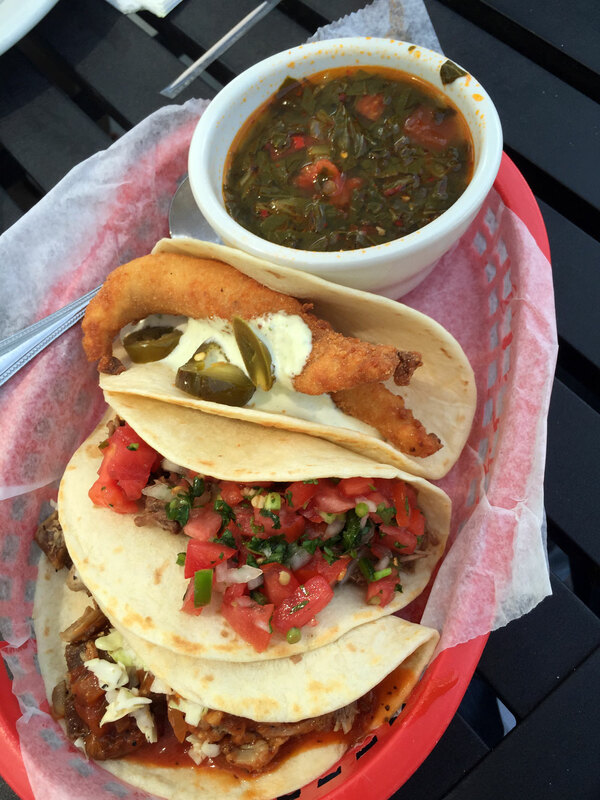 I preferred the smokier and the tomatilla over the regular, which was still quite palatable. 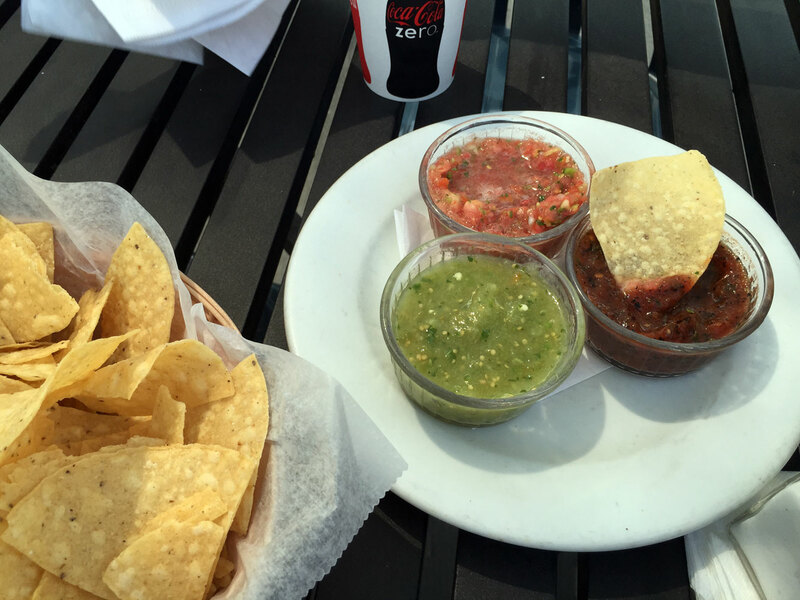 All three tasted fresh with plenty of lime and minced cilantro. We all has assortments of fish, pork and chicken tacos - I also had a side of the turnip greens which you'll see as a soupy tomato cup in the cheap taco baskets. 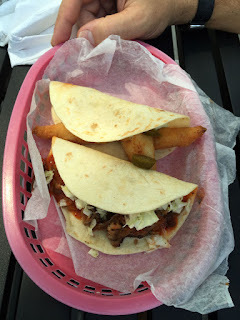 In all the food was fantastic and the well-remembered flavors still worth having. 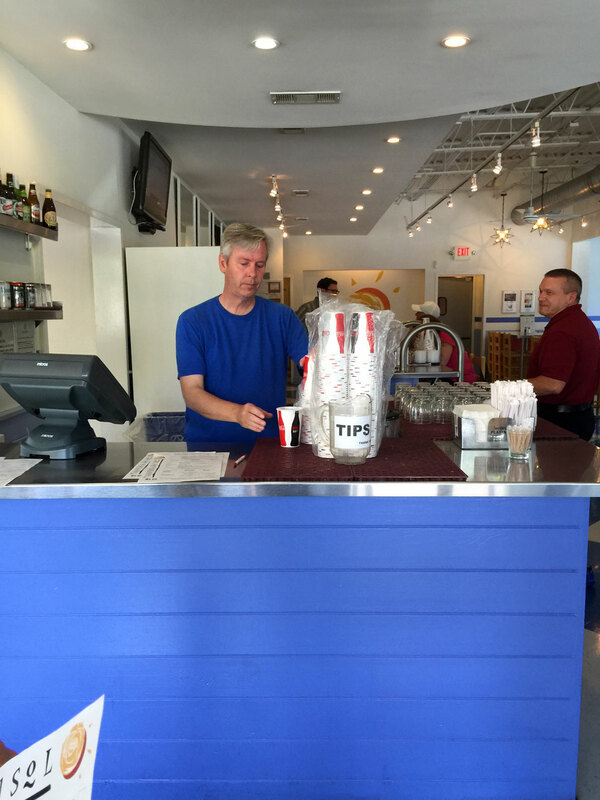 It's also a great location as an in-between spot if you work at the perimeter and are meeting friends or associates that are intown.